In climbing, problems are on the wall. In Indian climbing, problems exist off the wall too. 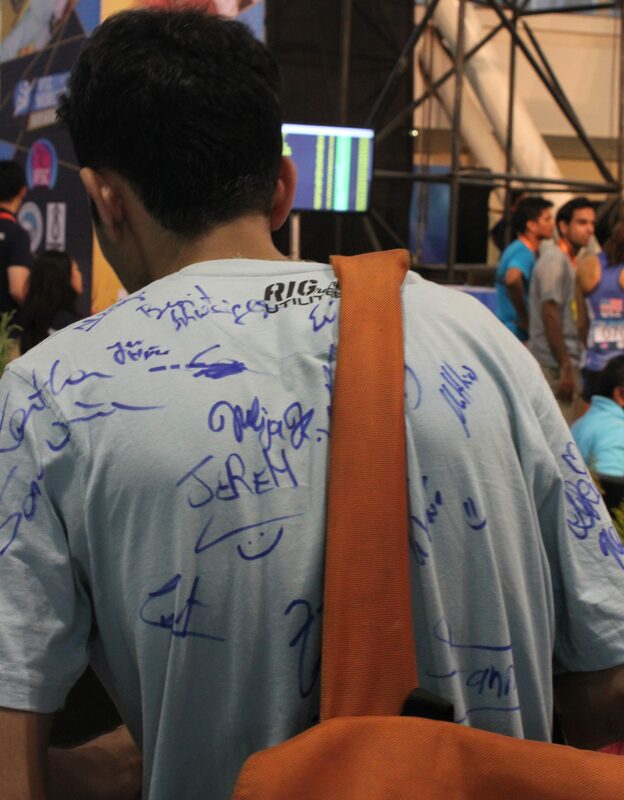 Nothing was more evocative of what happened to the Indian team at the 2016 IFSC World Cup in bouldering in Navi Mumbai, than this remark by a team member: it is easy to don the country’s colours; doing justice to it is another. 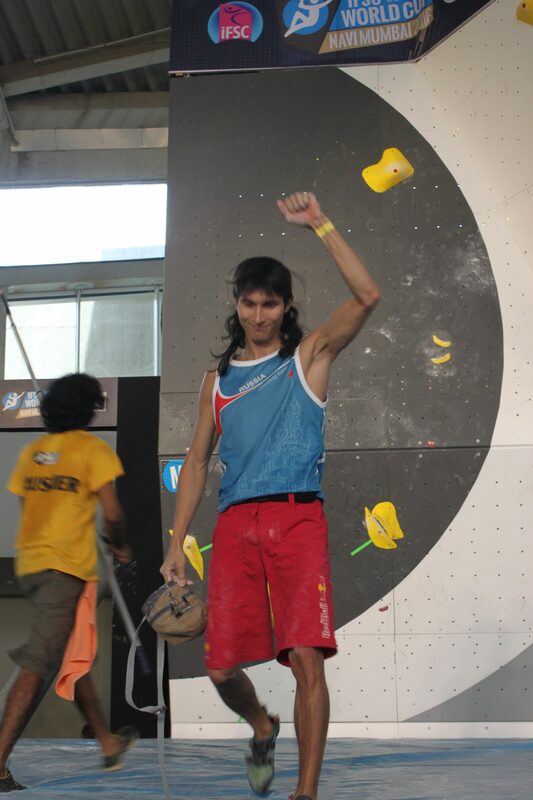 This is my last bouldering competition at this level. If you participate, you must prepare well first. Else, don’t participate. It was said honestly, sincerely. Being host country, India fielded one of the biggest contingents. 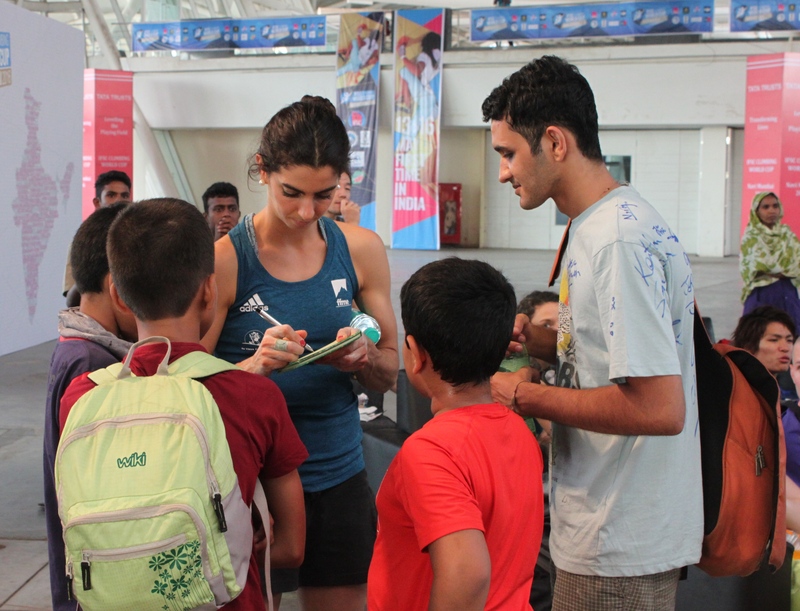 None of the Indian athletes made it past the initial qualifying round. 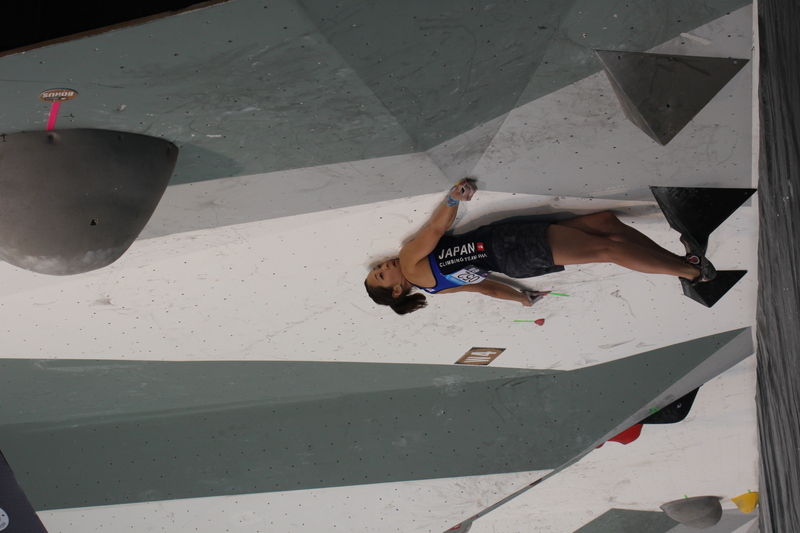 Not that the qualifying round at a World Cup is easy; it is difficult by domestic climbing standards. 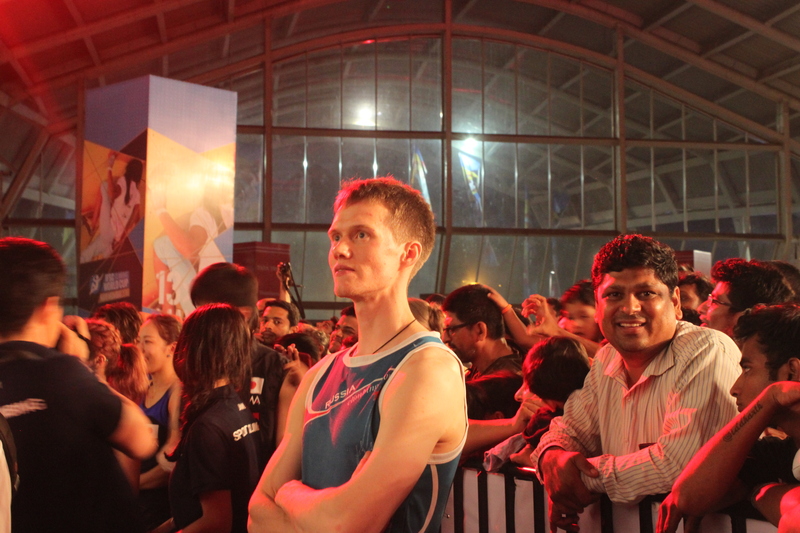 But a miracle was hoped for by many in the Indian climbing community given a World Cup had come to India. 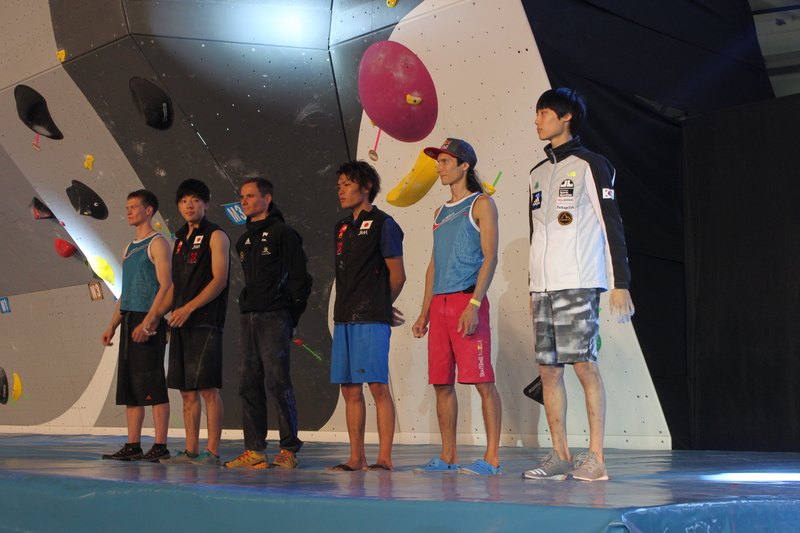 The climbers in the team provided many reasons. Although it was known that a World Cup was scheduled to be held in India, team selection and training didn’t happen well in advance. 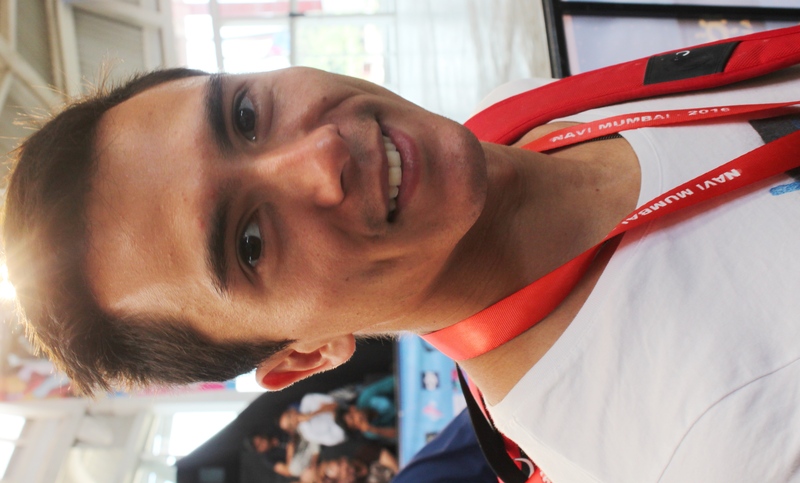 While the last national championship in climbing took place in the last quarter of 2015, team selection for the World Cup was done only by April 2016. Actual training, team members said, would have spanned a fortnight at best. A couple of them also availed loans and spent money from their own pocket to attend a climbing competition in Singapore. They thought it would help. According to some of the team members I spoke to, what is missing in India is a whole ecosystem that prepares you for competition climbing. To begin with, there are very few Indians travelling abroad to participate in international competitions, essential if a climber is to shoulder the pressure that comes with competing in an arena filled with people. The more you compete, the better you become at handling the pressure. Second, you need competent route setters at home who will challenge you and push you in line with the type of routes seen at competitions. “ You need a good coach, you need a good route setter,’’ one of them said. Third, while the route setter can imagine, the software in the mind transforms to hardware on the wall through a bank of climbing holds. Software and hardware are mutually connected. There are no big climbing gyms in India; certainly none of the sort that can be compared to the facilities some of the foreign athletes train at. 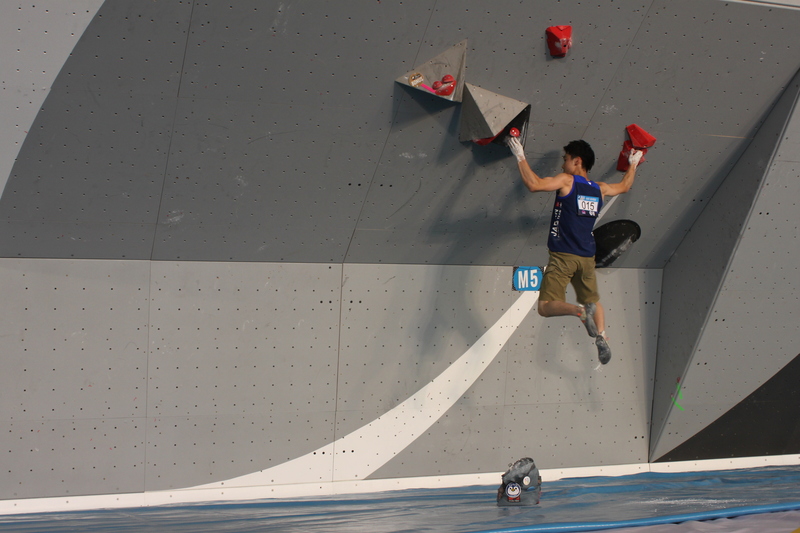 This leads us to a fourth point – Indians get to touch for the first time, many of the holds and voluminous features used on climbing walls only when they travel to compete overseas or a World Cup comes to town as it did in May 2016. They are not familiar with certain types of holds, especially the big volume holds and features, which typically cost more to purchase in the market and which are found more and more on contemporary competition routes. Foreign athletes on the other hand are so familiar with some of these holds that they are able to guess well on seeing a hold, which part of it may be capable of hosting grip. 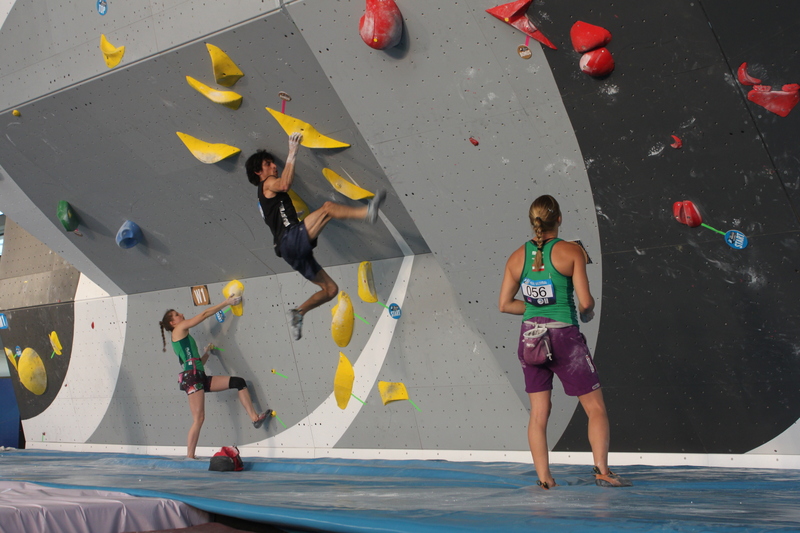 As was evident on the opening day of the Navi Mumbai World Cup, Indian climbers lose time figuring out how to grip a hold or feature, often at the starting portions of a climbing route. Fifth, traveling abroad and participating in competitions is an expensive proposition. Few Indians have the financial muscle for this. 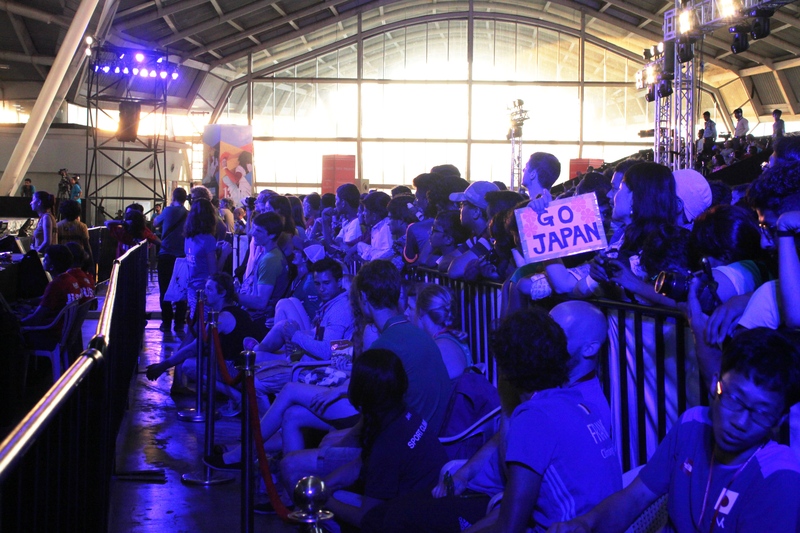 Some, including those driven by passion and borrowing for the purpose, manage to compete overseas. Going there for a precious learning experience denied at home, they return with few discernible results that home federation and sponsors can take notice of. As Indian climbers participate in international competitions without being able to make an impression, the outcome reinforces the feeling in officialdom that the whole exercise of going to World Cups is basically futile. “ This becomes a vicious cycle. Unless you support the athlete consistently and for long, he or she is not going to gain experience and without experience you cannot hope to make an impression at competitions like the World Cup,’’ a team member said. Lack of resources is typical of developing economies. 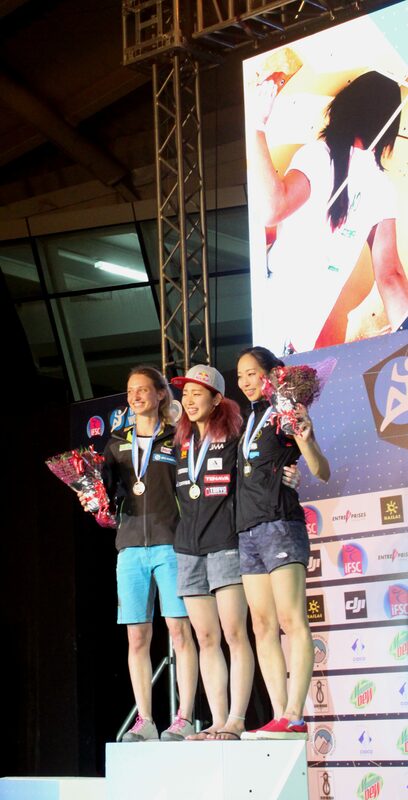 One of the interesting things happening in climbing is that even as it is recognized as a sport with European roots, at present its growth is driven a lot by the Asian market. Affordability cannot be ignored in such contexts. The Navi Mumbai World Cup is itself an example of this drift – climbing’s rising popularity in Asia helps endorse the case for a World Cup in India. At the same time, budgetary constraints saw one of the walls used in the competition being fabricated locally. That is the affordability paradigm at work. 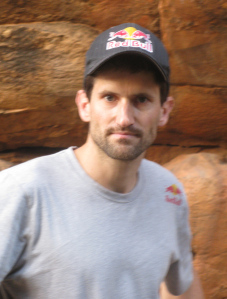 Sean McColl is Athlete President in the Athlete Commission, which represents the interests of climbers in the World Cup circuit. I asked him if any athlete exchange programs or special funds to train athletes from the developing world were being thought of as climbing journeys to new geographies. He said nothing has been thought of yet. Potential reasons for it ranged from a lot of the administrative and developmental work in climbing being done on a voluntary basis to the athletes’ own busy schedules. However the IFSC, he said, does what it can to spread the software of climbing, like courses for judges; the rationale being that if climbing infrastructure and know-how grow, then climbing of good quality will follow. As my question was posed against the backdrop of Indian climbers and their feeling that lack of competition experience was doing them in, Sean highlighted another angle: Asian teams like those from Japan and Korea, have had athletes come for their first World Cup and yet make an impression. He had a point. For instance, climbers from Iran are familiar to the Mumbai climbing community thanks to the previous visits they made to participate in the Girivihar annual climbing competition. Iran had two athletes in the men’s semifinal. Singapore’s Ashraf is similarly known to the Mumbai crowd. 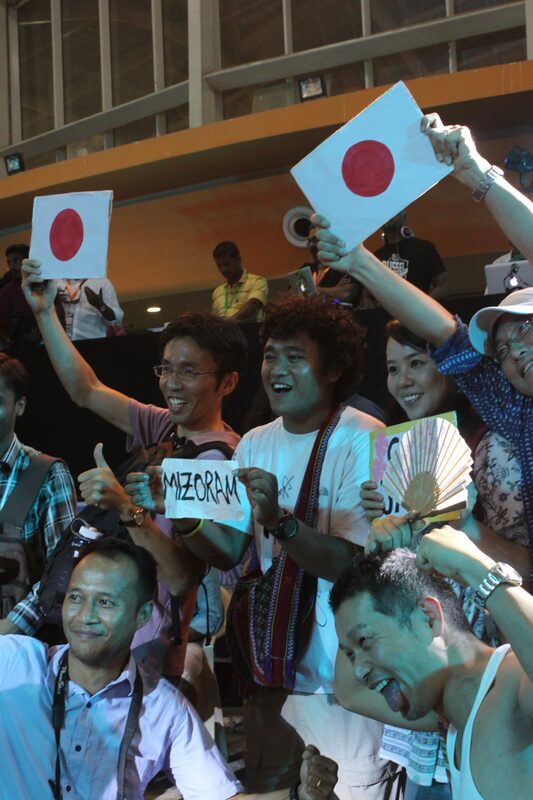 Although he didn’t reach the semis, he put up a creditable performance. “ It may also be a case of having to work on strength,’’ Sean said as he prepared to leave the venue late evening, having watched the women’s qualifying round. 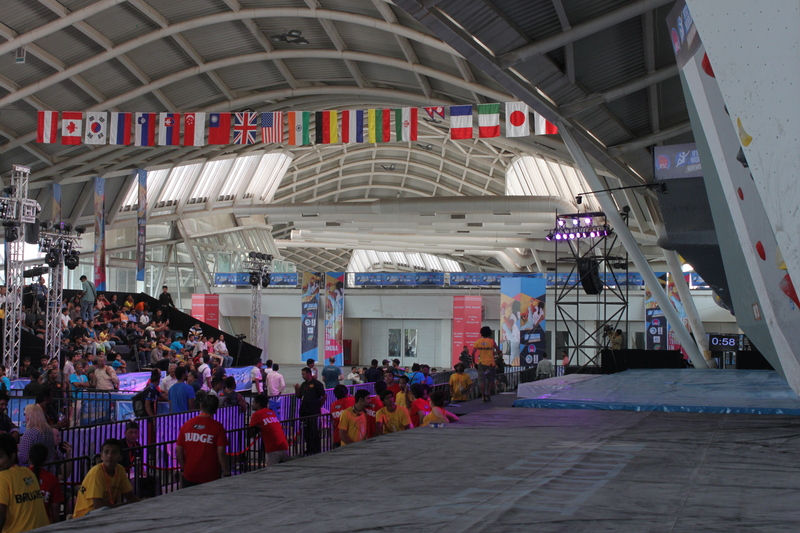 In the audience at Navi Mumbai, witness to the collapse, was a large contingent of sports administrators and officials overseeing Indian climbing. One thing is clear. The time for excuses is over. Indian climbing either gets its act together and goes about improving the quality of climbing or stays content hosting World Cups. A rising generation wants creative thinking and results to show so that they can stand shoulder to shoulder with the best in the world. The journey will be tough. But the least everyone can do is – make it happen. 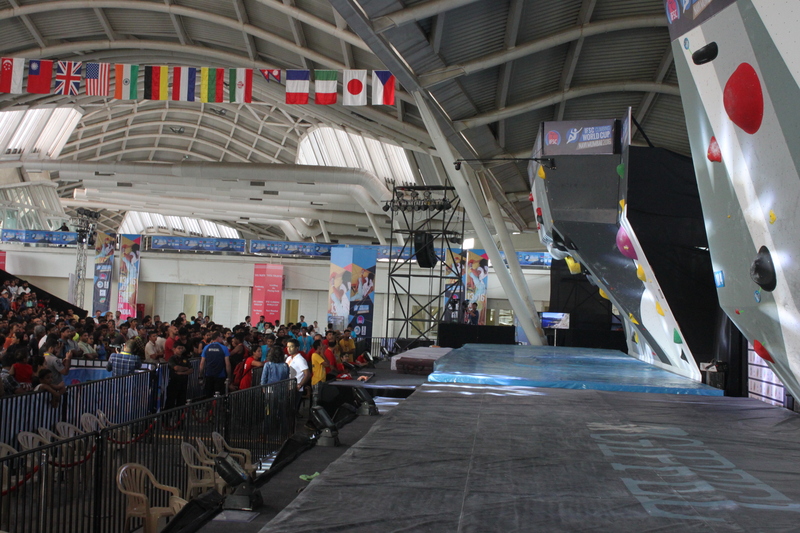 Updates from May 13, the eve of the IFSC World Cup in bouldering at Navi Mumbai, will be appended suitably to the article titled `IFSC World Cup: Countdown Begins in Navi Mumbai,’ posted earlier. Please visit this article and that, for a comprehensive overview. “ All we need is a watch painted on that hold and it would be like Salvador Dali’s painting,’’ I told Prashant. We sat on the stands, two fans of climbing observing route setters at work on a climbing wall. If earlier in this blog I called their work, art, it is for a valid reason. A climbing wall; sculpted and painted imaginatively and sporting colorful holds and features, resembles abstract art. Tad, like an Alexander Calder piece, albeit frozen still, stuck to a surface. A climber weaving his way up, adds mobility to the installation effect. The route setter’s intervention is where competition climbing on artificial walls, makes the transition from the cold nuts and bolts of the wall’s engineering, to the art of its facade. In some ways, it encapsulates the peculiar attraction climbing offers – it is math and art at once, it is disciplined training and intuition, it is straight lines and fluidity. 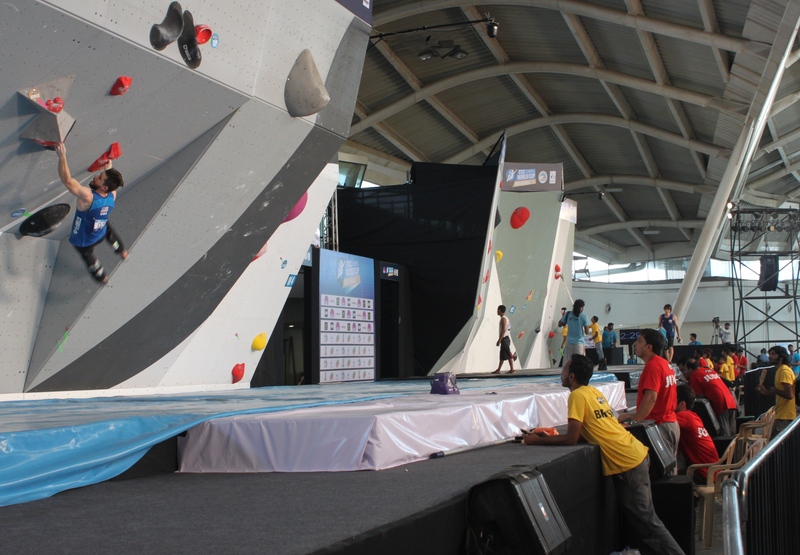 It is time, for India’s first World Cup in bouldering; 82 athletes have registered (17 from India, the rest from overseas), the competition commences in Navi Mumbai tomorrow, May 14. The last couple of days in the run up to the World Cup were a bit tense. 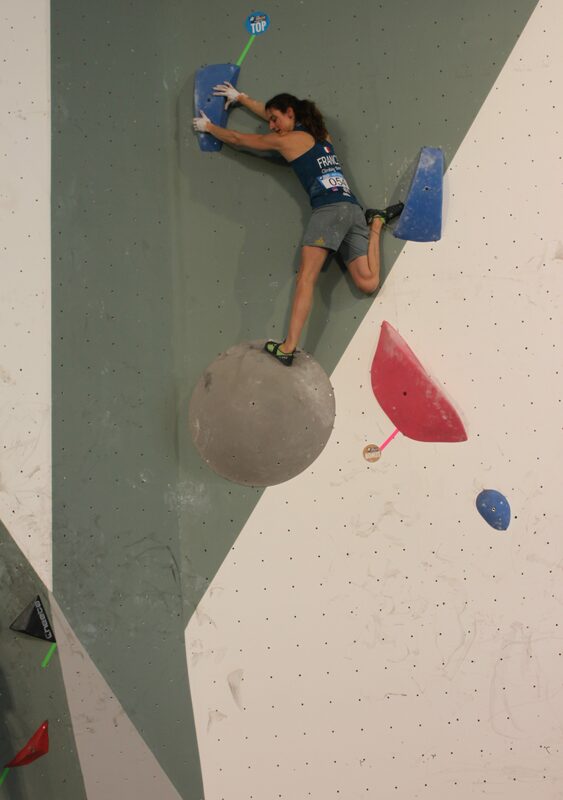 The most critical piece of hardware at a climbing competition is the wall. 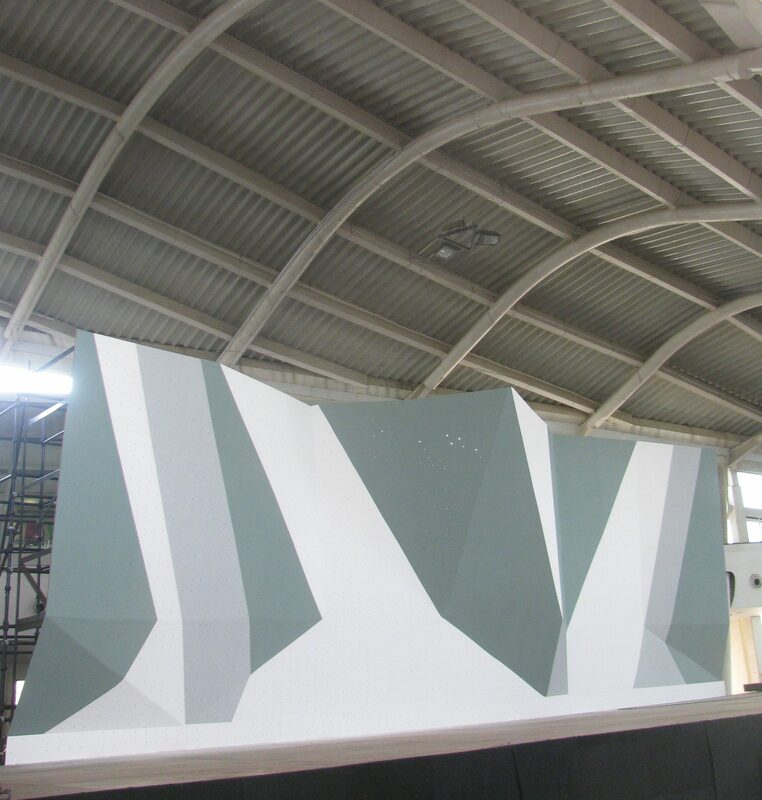 The marine container bearing one of the walls for the World Cup – a bouldering wall dispatched by one of the biggest names worldwide in the business of climbing walls, shipped in from their facility in China – was brought straight to the venue from the port. Much was expected from this imported wall. Made by an experienced company it was to be benchmark. Upon assembling however, challenges cropped up. There were issues with aligning the wall to the stage, there were mismatched components and some nuts and bolts had not been included in the shipment. After a year spent preparing for the World Cup, this was a disappointing moment for all. It cast a pall of gloom at the venue. But not for long. The manufacturer’s technician and event organizers put their heads together and came up with an optimal solution. The mismatched portions of the modular wall were rectified locally. The team of climbers entrusted with installing the two walls, got cracking. They got the wall’s base aligned. The installation of frames and panels started. Issues with fit and finish emerged. Raju, the carpenter who has regularly contributed to Girivihar’s walls, was recruited to assist with some of the panels. Eventually the imported wall was up. The lengthy process delayed the wall becoming available for the route setters to work on it. By noon May 11, the route setters, having already done much work on the locally fabricated wall which was in place earlier, commenced their work on the imported wall, designing climbing routes the moment a face was ready. By late evening May 12, the imported wall hummed with route setters’ activity. DJ and music system had arrived at the venue; music fueled the route setters’ work and Prashant was lost in his favorite song playing on the big speakers – Metallica’s Nothing Else Matters. Christophe Billon, IFSC’s Technical Director for the World Cup, is the person who has final say on competition proceedings. I asked him what he thought of the two walls. 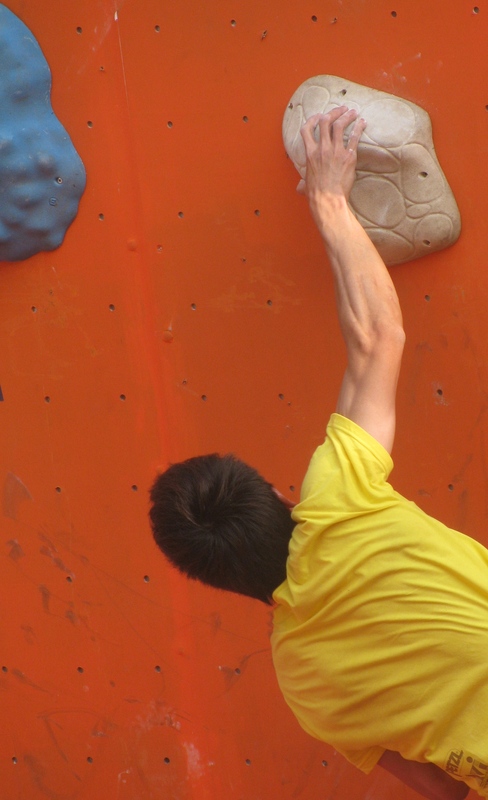 To begin with he pointed me to the fact that the two subjects in focus were bouldering walls, which, unlike lead climbing walls, don’t go up very high. That makes challenges in design and fabrication easier to handle. He couldn’t immediately recall previous instances wherein the IFSC had gone along with a locally fabricated wall for a World Cup. Navi Mumbai that way appeared to be treading less visited terrain if not breaking new ground. Although he had asked for a couple of changes here and there, on the whole, he felt that the locally fabricated wall was stable and well built. “ Its fit and finish is good,’’ he said. The imported wall, he conceded, had ended up a bit of a disappointment. 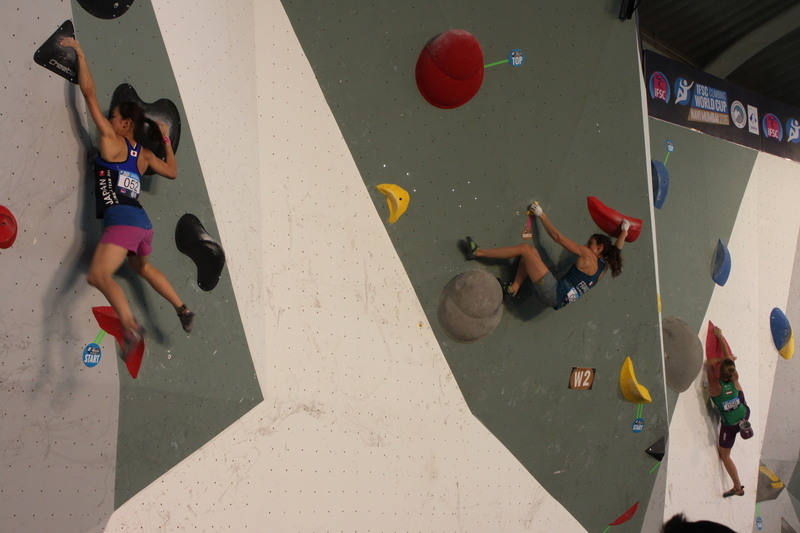 But the silver lining is that the two walls are so different in shape and character that taken together, a rich variety of climbing routes to challenge the athletes is possible. “ In combination, the two walls work well,’’ he said. 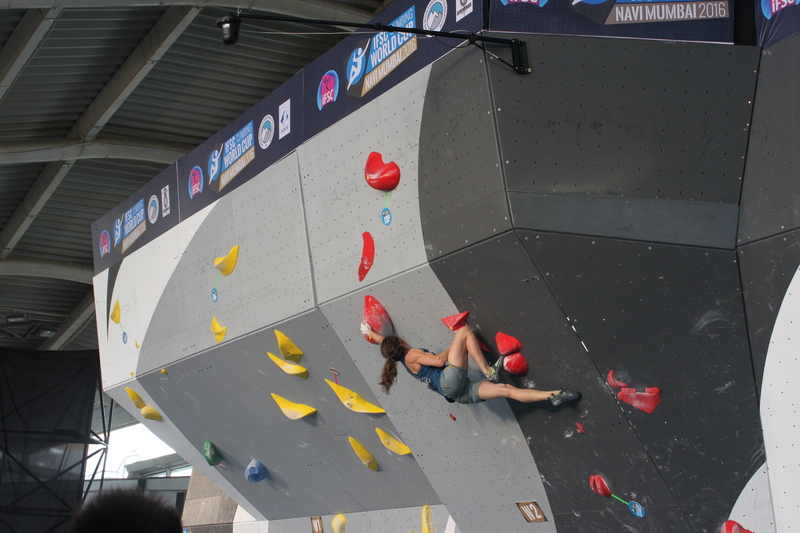 The Navi Mumbai edition of the IFSC World Cup in bouldering is the first World Cup being held in India. 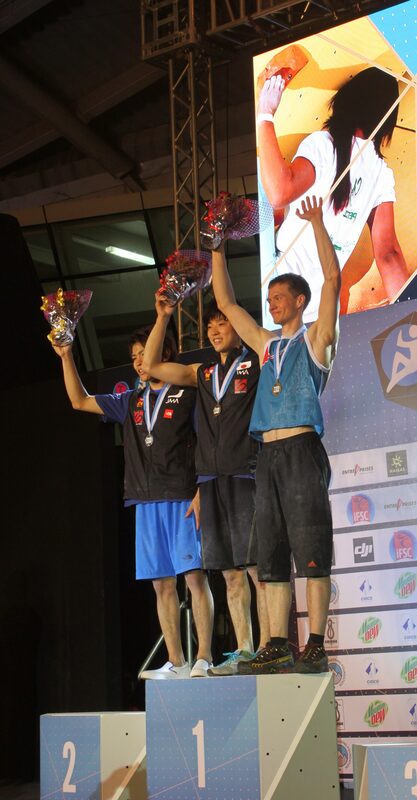 The World Cup in climbing is a series of competitions held annually in various countries, under the aegis of the International Federation of Sport Climbing (IFSC). Each edition culminates in podium finishes with points accumulated to crown overall winners by the end of every series. The Navi Mumbai edition, organized by the Indian Mountaineering Foundation (IMF) and Girivihar, falls close to the middle of the series currently underway. In trends so far this World Cup-season, the women’s field has been dominated by Shauna Coxsey of Great Britain, who with her last win at Chongqing in China, has notched up an incredible four straight wins. 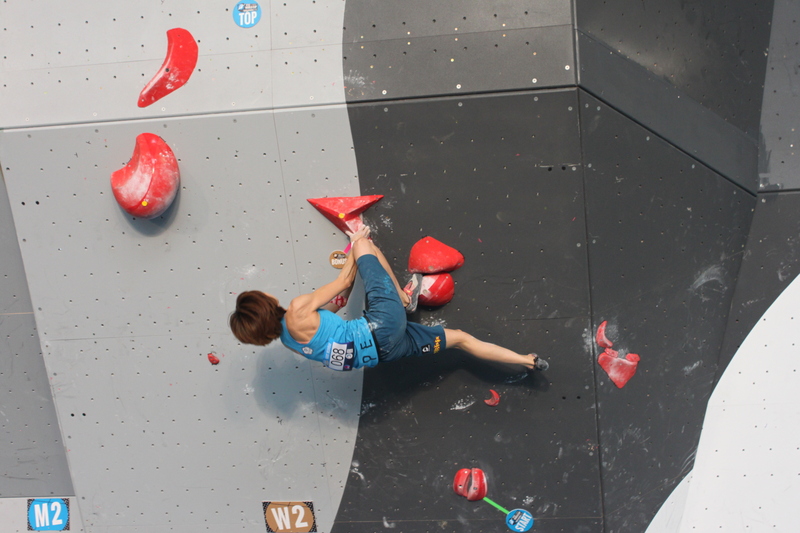 Although she is at present leader by a sizable margin, there are strong, experienced climbers like Akiyo Noguchi of Japan in the field. With only less than half the journey done so far, much can change going ahead. In contrast, the men’s segment appears filled with closely matched competitors; consequently, it has been a see-saw battle in the run up to Navi Mumbai. Although a host country in 2016, sport climbing has a relatively recent history in India. 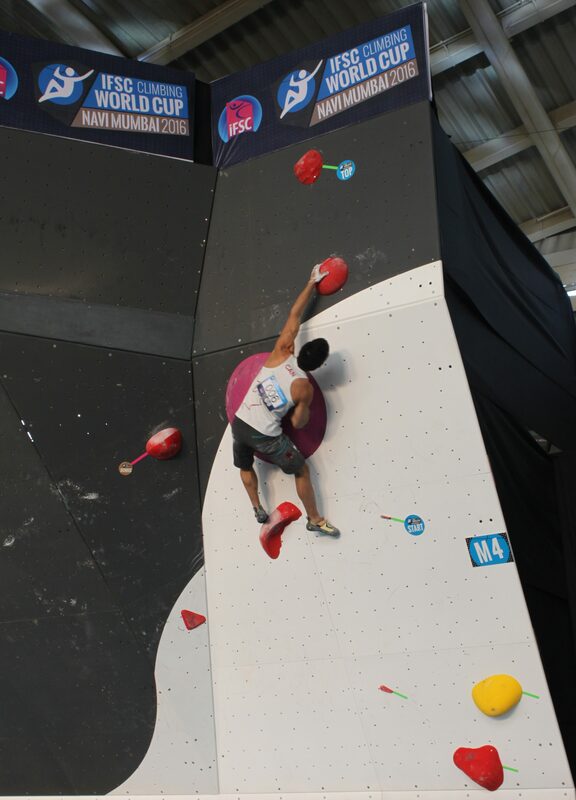 The 17-member Indian team at the Navi Mumbai World Cup includes some of the best young climbers in the country. While IMF is the host federation, the work at ground level has been done by Girivihar, Mumbai’s oldest mountaineering club. CIDCO, the agency which designed and built Navi Mumbai, extended their Exhibition Centre in Vashi as venue for the World Cup. There were many challenges along the way, the most consistent of which was perhaps, funding. 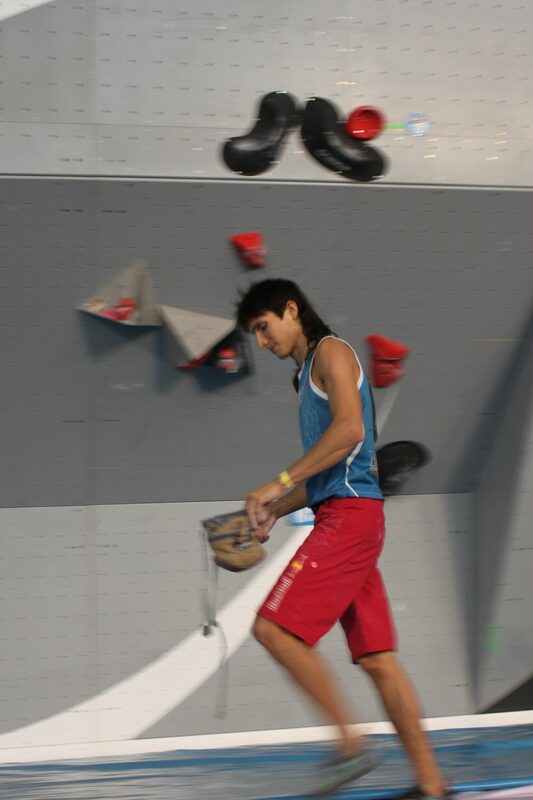 To address the resource crunch, one of the climbing walls was locally fabricated to IFSC standards. A round of crowd funding was done. In the final stretch of preparations, Tata Trusts stepped in with a financial grant. That was oxygen. From the confines of a hot, sweaty warehouse in Taloja, the locally made wall traveled in dismantled form to the venue in Vashi and was put together at site. Painted and with route setters working on it fixing colorful holds and features, it looked every bit the art work, climbing walls remind of. Two evenings later, the imported wall joined in, providing company. It’s time for the athlete’s art. May 8 was a hot day. At the venue of the upcoming World Cup in Navi Mumbai, the shade of CIDCO’s Exhibition Centre and sunlit day outside harbored an indistinct disparity. It was warm even in the shade. Warm enough for two of the four gentlemen, waiting for a climbing wall to be ready, to take off their T-shirts. A third, who had visited India before and climbed at Hampi and Badami, had chosen a vest over a T-shirt. 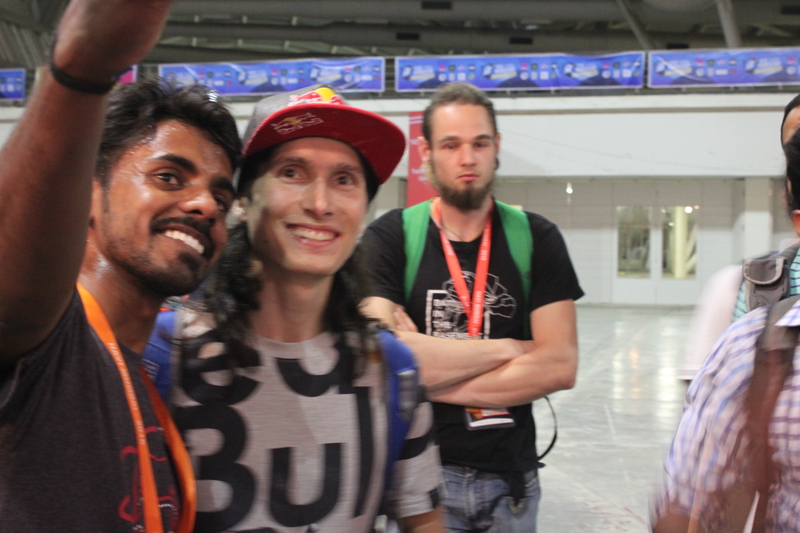 Manuel Hassler, Mathias Woitzuck, Laurent Laporte and Gen Hirashima, hailing from Switzerland, Austria, France and Japan respectively, formed the four member-route setting team dispatched by the International Federation of Sport Climbing (IFSC) to the Navi Mumbai World Cup. 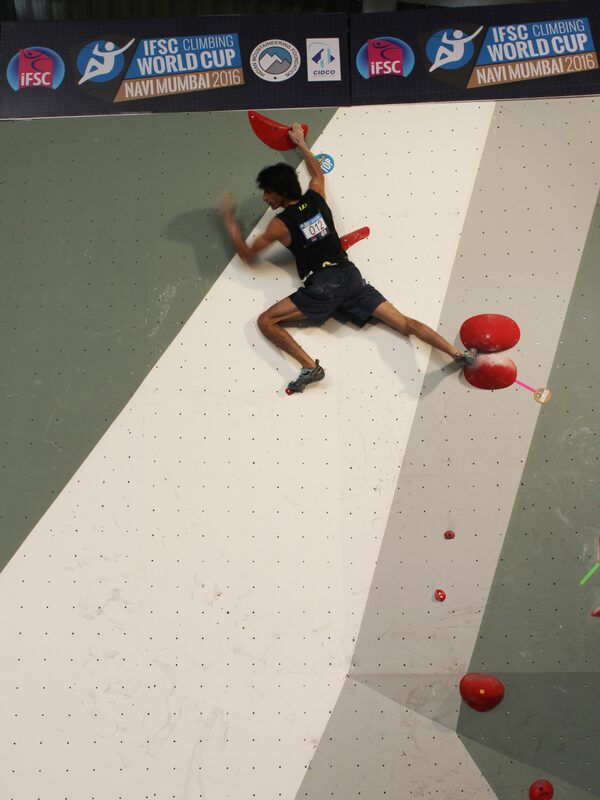 Praveen C.M, one of the best sport climbers in India, was expected to join as a fifth member. Manuel was Chief Route Setter; Gen and Praveen, aspirant route setters wishing to grow their skills by working with the experienced. Laurent was the most experienced; he had begun route setting for international competitions conducted by sport climbing’s apex federation, at a time when the IFSC wasn’t yet born and sport climbing was still overseen by the UIAA, currently dedicated to mountaineering. The wall imported for the competition, had arrived and not been installed yet. The quartet admired the locally fabricated wall from far; they checked it up close. Then, the inevitable happened – they imagined routes on it. Doing so, they moved their arms to reach non-existent holds, raised their legs to step on invisible footholds and let the body flex this way and that for balance, generally swaying like ballet dancers. Four components complete a World Cup ecosystem – athletes, route setters, judges and spectators. You have a good competition, when all four blend beautifully. Of these four, the one role functioning akin to a sensitive instrument gauging the ecosystem is the route setter. All serious route setters are themselves good climbers. That’s because a sense of body movement is critical to set routes that challenge climbers. But here’s the interesting thing. Most of us equate challenge and difficulty with moves requiring strength to execute. However, strength and power and are only two of the several aspects shaping a good climber. A good climber is a composite of many other talents too including the ability to solve a set of climbing moves that resemble a problem on a route; climbing creatively, handling the overall pressure of competition and taking risks while climbing. 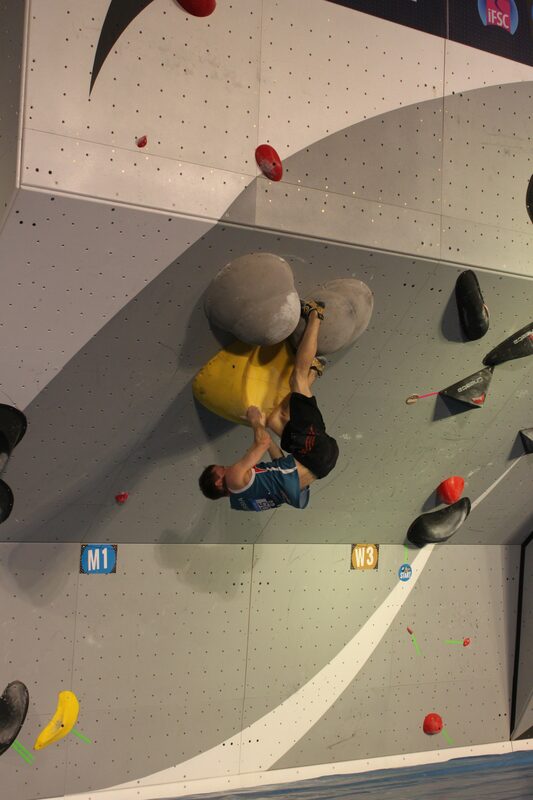 When route setters stare at a blank wall defined yet only by its angled faces, they can imagine different configurations of climbing holds and features on it, to create routes. They work once a wall is ready to host climbing holds. When they work, designing a collection of routes ahead of competition, access to the wall is restricted. No photography is permitted because these routes are the puzzles at the heart of a competition. But it isn’t as simple as accumulating a bank of puzzles, tucking it away and monotonously pulling it out one by one from the kitty during the course of a competition. Route setters sway like grass in the wind for a valid reason. They sense which way the wind is blowing at a competition underway. Their imagination and response to real time stimuli is what keeps a competition entertaining. That means you may pull out routes from your kitty but the going will be dynamic, with changes in response to a live situation and state of competition. 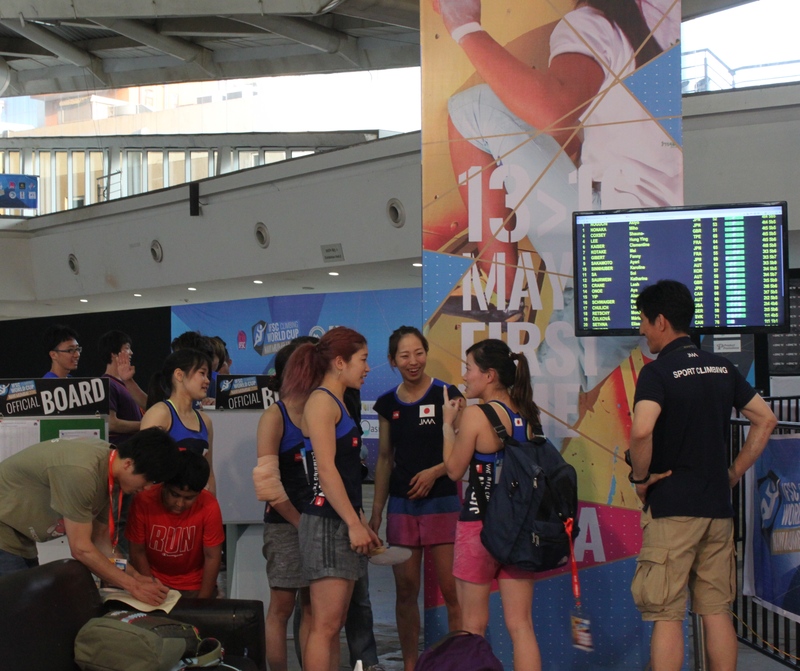 According to the team now in Navi Mumbai, route setting at the start of the World Cup season is a bit of a guessing game for the athletes are returning from a break and well deserved rest after the preceding competition season. You give challenges and gauge response for a sense of where the field stands. As the season progresses, the vagaries slowly fade and trends creep in. The athletes warm up to peak performance. 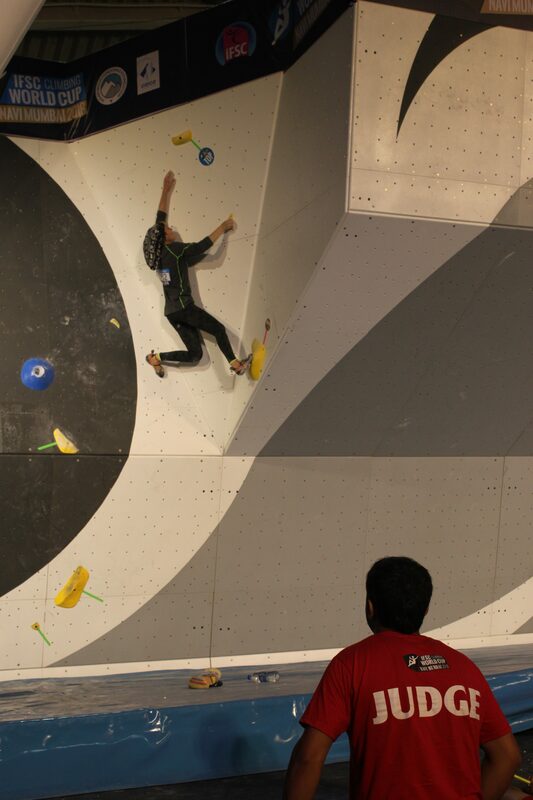 The route setters draw into their bank of routes and play the virus in the system, keeping the going edgy and unpredictable with their creativity in route setting, building each competition to an interesting final. While doing so, they also listen to local stimuli, which is where the spectators matter. 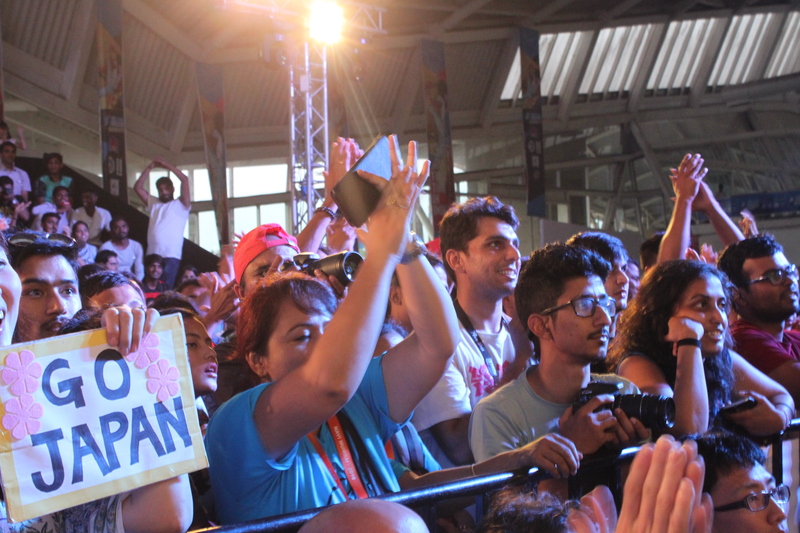 Spectators nowadays fall into two categories – there is the audience physically present at an event; there is the global audience available through live-streaming over the Internet (the Navi Mumbai World Cup will be streamed live). 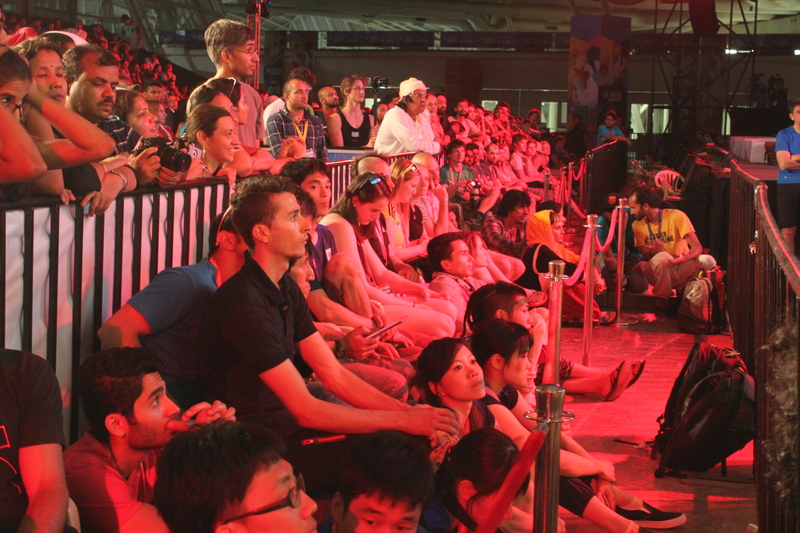 An engaged audience, aware of climbing and its nuances eminently adds to the quality of proceedings. Marathon events worldwide are remembered by the cheering runners receive. 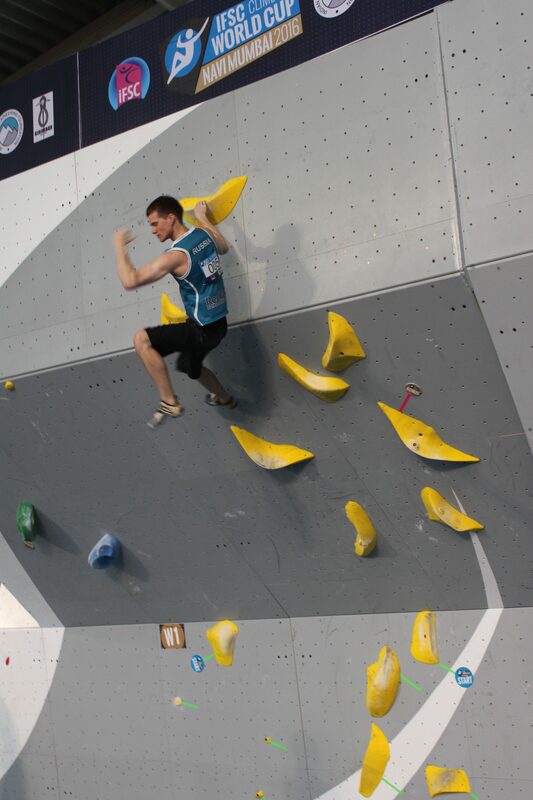 As in running, competition climbers love support and encouragement. It motivates them to perform. 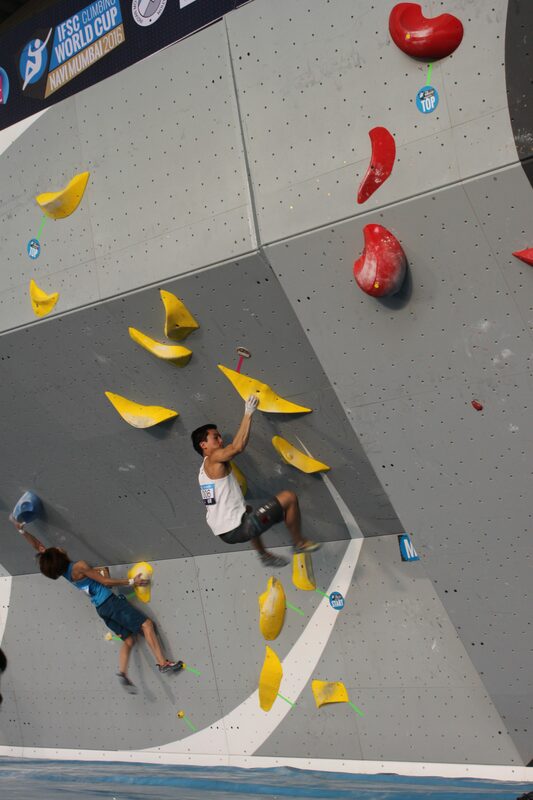 It builds a climbing competition’s ecosystem. It is among stimuli, the route setters in the wings listen to. Since variety and edginess are essential ingredients for enjoyable competition, route setters too are used with discretion. One team doesn’t do the route setting for a whole World Cup season. 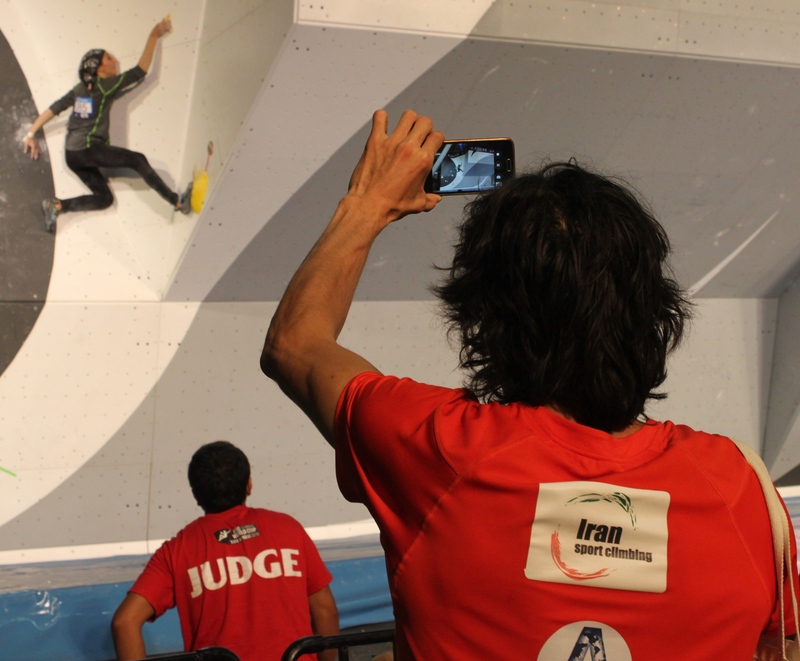 The IFSC has its list of qualified, experienced route setters and multiple teams work on the many competitions of a World Cup season. This ensures that a single line of imagination does not dominate the routes set for a season. 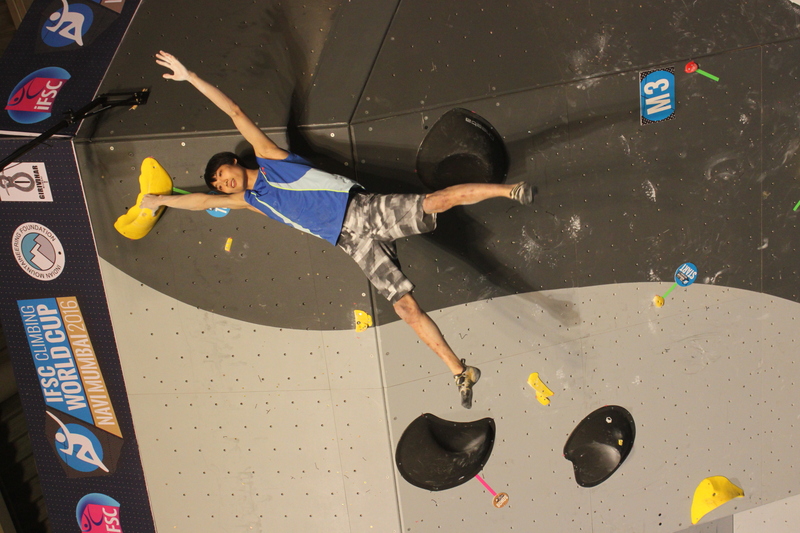 Each of the four route setters now in Navi Mumbai, have their individual preferences as regards climbing problems and climbing styles. They work as a team to make sure that all this is available at hand as ingredients and yet no one climbing style or type of problem unnecessarily dominates and characterizes a competition. This versatility – the desire to have a diverse tool box for one’s work – appeared kept alive by the individual route setter too. Laurent for instance, was clear that he valued having his personal climbing straddle both lead climbing and bouldering without entrapment in one. As regards concerns – thoughts weaned from the experience of having set routes for many years – they said that perhaps the competition season’s length needs revisiting. Climbing is a demanding sport. As anyone who has attempted a challenging climbing route will tell you, the act drains you. Athletes on the competition circuit are climbing as best as they can; one competition after another. 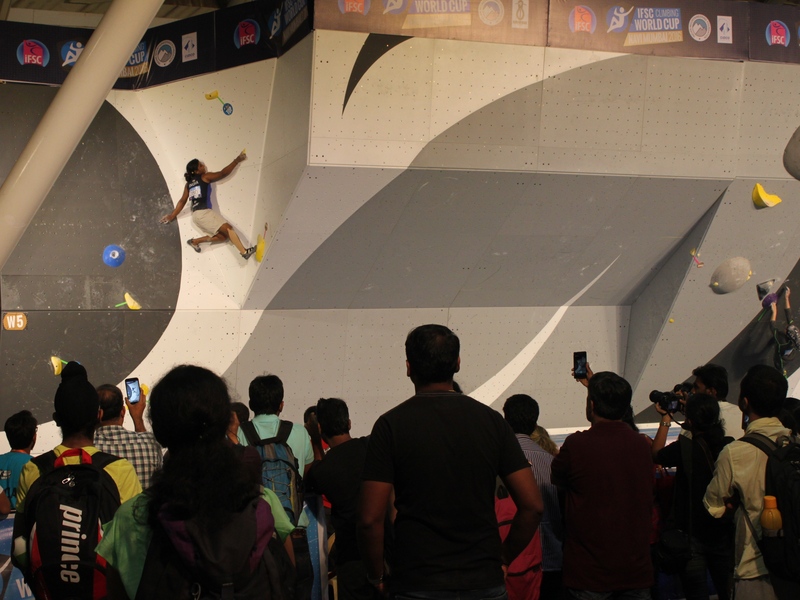 While the World Cup at Navi Mumbai is focused on bouldering, there are athletes taking part in both bouldering and lead climbing. It elicits a toll as the season progresses and in a circuit where athletes are one of the fundamental building blocks, tired athletes can affect that all important ecosystem. Should there be fewer competitions so that the ecosystem stays robust? – That could become something to think of. 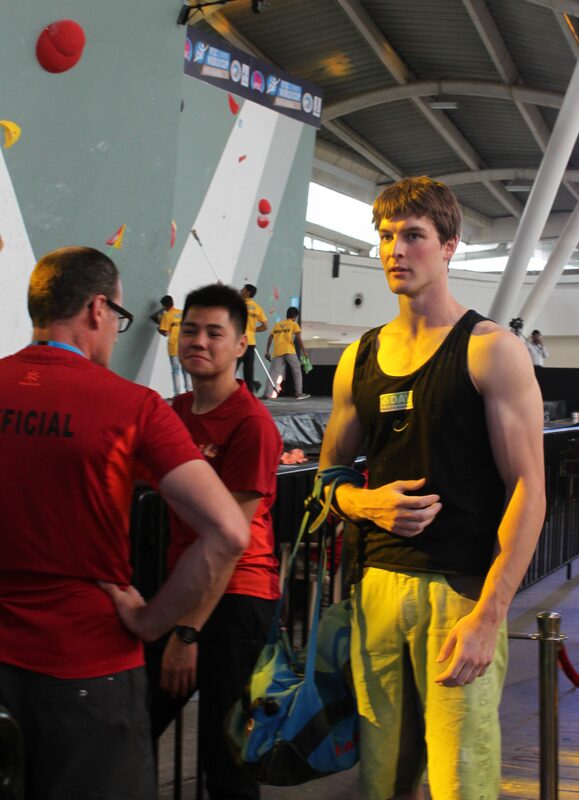 In the same vein, another important factor which may impact the route setter’s art is climbing’s potential debut at the Olympics. While details are not yet known, what has so far appeared in the media, seems to indicate a drift to acknowledging the best climber overall as the Olympic ideal. 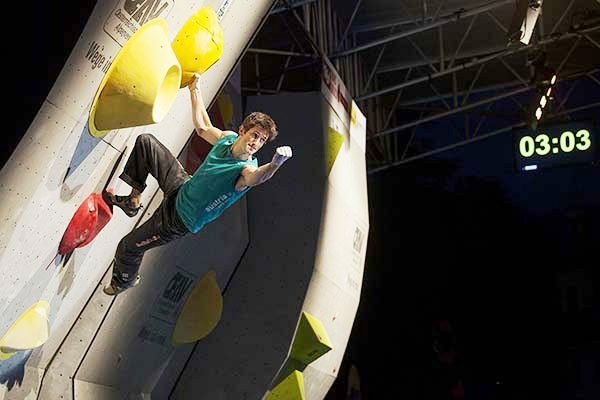 Competitive climbing currently straddles three distinct categories – lead climbing, bouldering and speed climbing. Like the temptation in science for a theory of everything, it will be interesting to see how the journey to the Olympics influences the route setter’s art. What are your memories of your first World Cup? My first World Cup was in 1999. I travelled to France for rock climbing in Ceuse, Orpierre and the like. I joined the event in Gap without any expectations or pressure. There was no such thing as an Austrian team. As far as I remember, my friend Reini Fichtinger who I was travelling with also competed. I ended up 22nd and thought there might be a potential to enter the finals (at that time, 20 people went to the second round which was the finals). 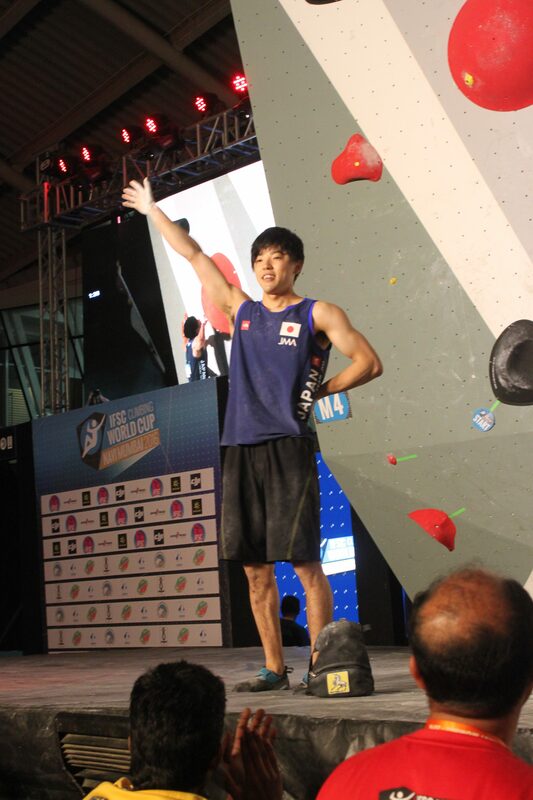 You are one of the most successful competition climbers in bouldering. What did you do to stay fit and competitive? How much time did you invest in climbing? People spend hours at offices. 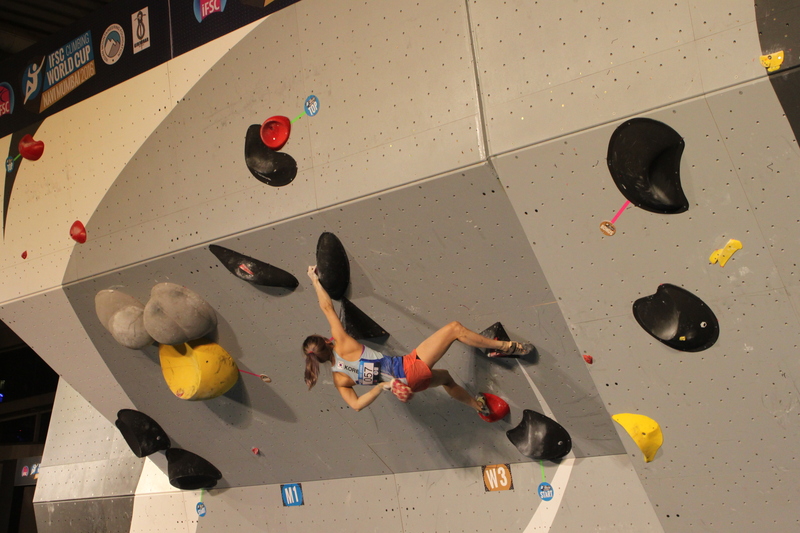 Can you tell us how a day in climbing’s office was like, for you, in your World Cup years? I trained more in my early twenties; less later. I needed to build up strength and work on my weaknesses. By the time I turned 25 I had developed a solid climbing style and was one of the stronger athletes in the field. The years after that I profited most from my experience and trust in oneself. Climbing is a powerful sport, taking breaks is necessary and rock climbing can help you develop your technique and style. I usually trained five times week. Always two days on, one day rest. Which were your finest moments in the sport at the competition level? That would be – winning my first World Cup by a large margin in Erlangern, Germany in 2005, becoming European Champion in 2013 and winning my last World Cup in Innsbruck, Austria in 2014. 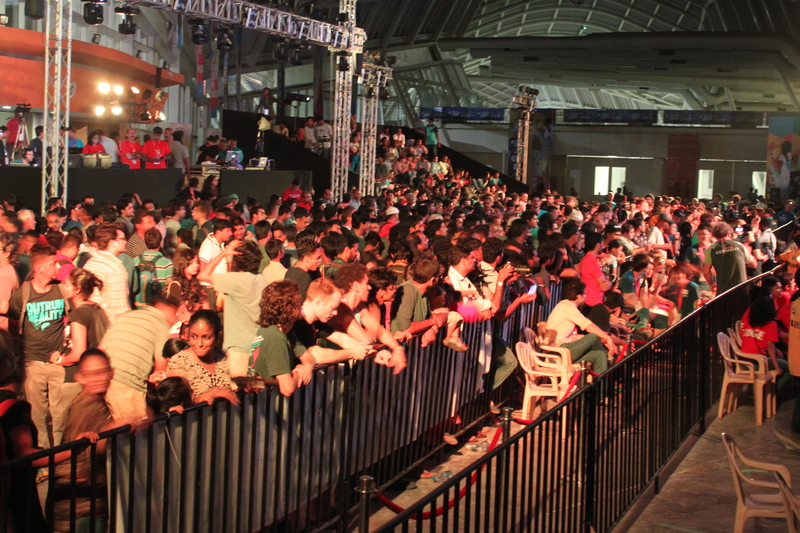 How intense is the competition at the World Cup? 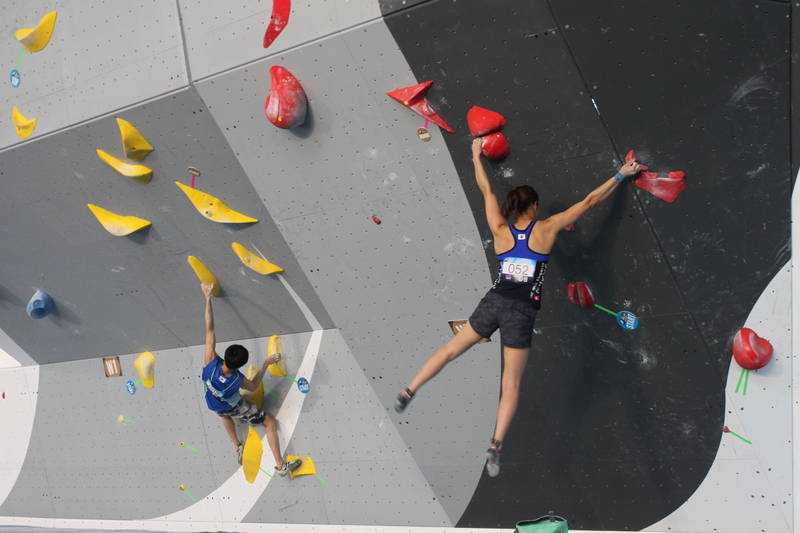 Were you and your fellow climbers at World Cups always competitors seeing each other so, or did you pick up good friendships that have stayed strong past your competition years? I always saw the other competitors as people to learn from. At the end of a round you were in a good position if you performed well, no matter what the others did. In climbing you don’t have a direct opponent. You are challenged by the `problem’ / route and yourself. What does ` competition’ mean to you? Do you see it as a phase in an athlete’s life or is it what you always live by? 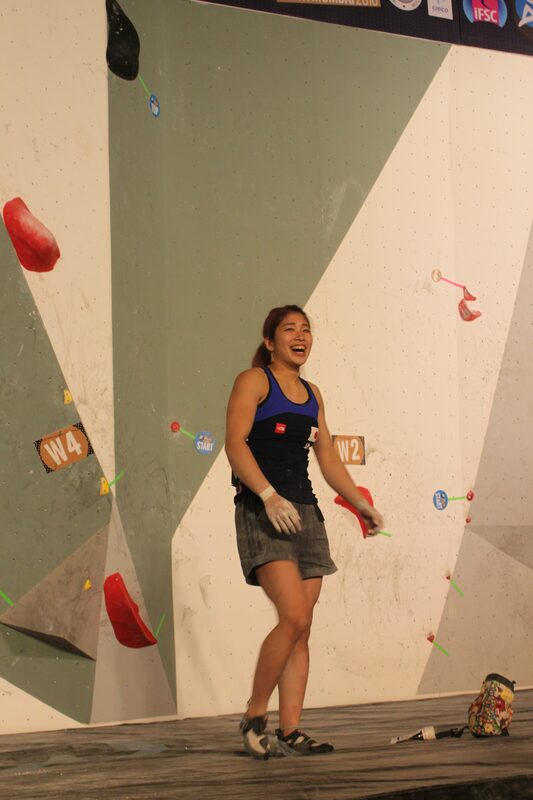 If it was a phase, then what is the driving force for you in climbing nowadays? I probably did 100+ World Cup events and I feel confident saying that I am not a competitive person, I actually shy away from comparison. 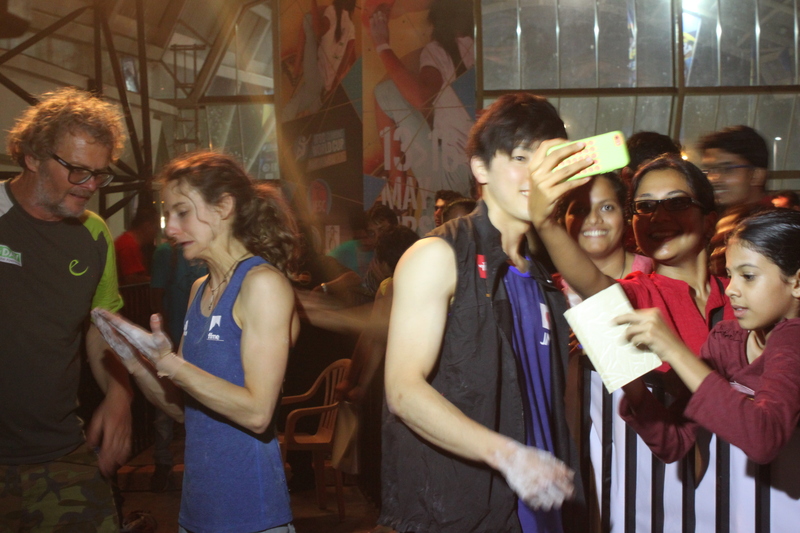 Competing was always a sort of game, interaction with others and yes, a challenge. The uncertainty and the pressure to perform well at a certain moment of time always held something alluring for me. Nevertheless, I am glad I got rid of the pressure. Can you explain what difference you find between competition climbing, done typically on artificial walls, and climbing in the open, on natural rock as you do often now? Is there a drift to the purer ethic in this and is the purer ethic being out, free and climbing rock? For me, both are climbing. I prefer climbing outside, especially when combined with trips and longer stays. But gym climbing can also be very entertaining. I am against a strict classification that goes hand in hand with how to value what. While it is good to be sponsored, as a competition climber how did you handle the knowledge that sponsorship is dependent on performance and if performance falls, sponsors may stay away? Was that ever a source of pressure? Well, sometimes, especially when under-performing you might feel pressure. In my case though, I could always rely on sponsors who saw beyond single achievements. Most of the companies have been supporting me for more than five years. Long term cooperation definitely helps to reduce the pressure. You were a top athlete in a sport that wasn’t part of the Olympics. 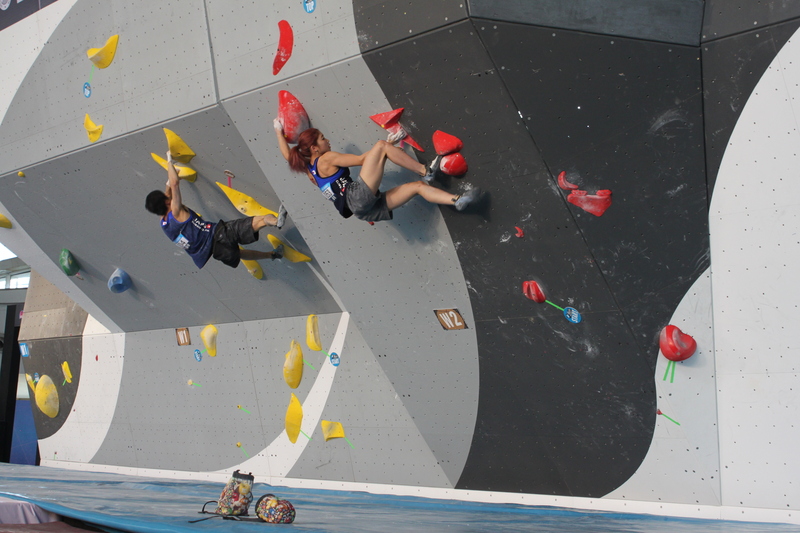 If all goes well, climbing may debut at the 2020 Tokyo Olympics. Do you see climbing’s entry into the Olympics as a major development? If so, what impact will it have on the sport? 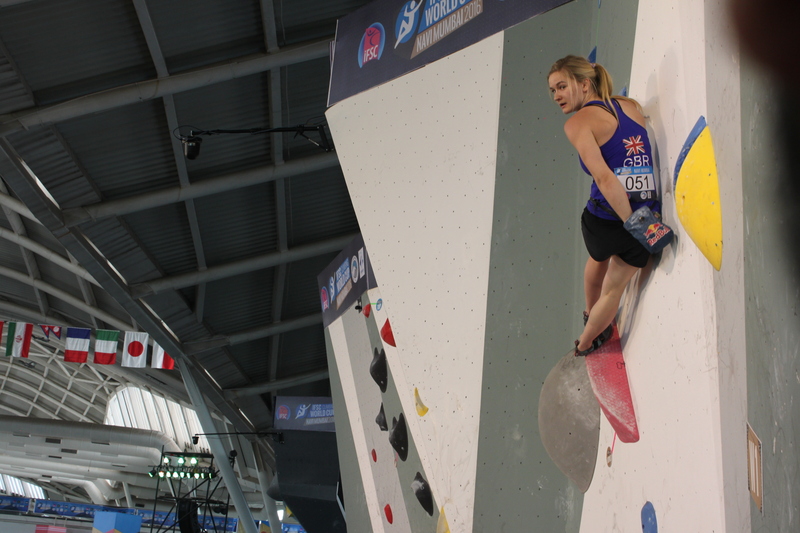 This will very much depend on how climbing will be implemented in the Olympic circuit. If the IFSC prefers to push for an Olympic discipline that has never been tried and does not exist, then I see it rather critically. 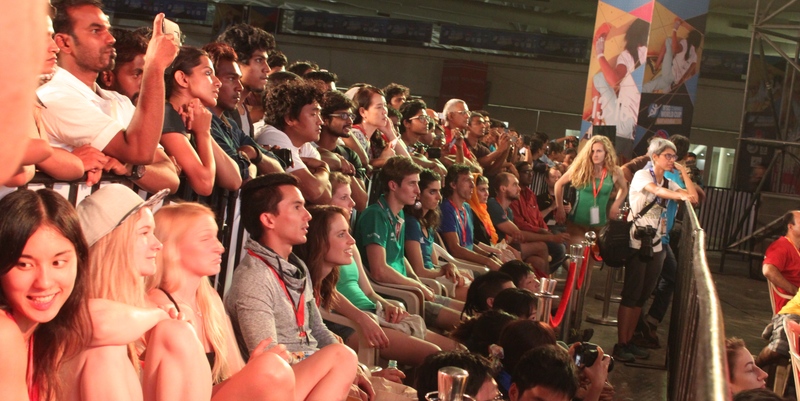 The first set of young people aspiring to be full time climbers has just emerged in India. Some of them will be participating in the Navi Mumbai World Cup. 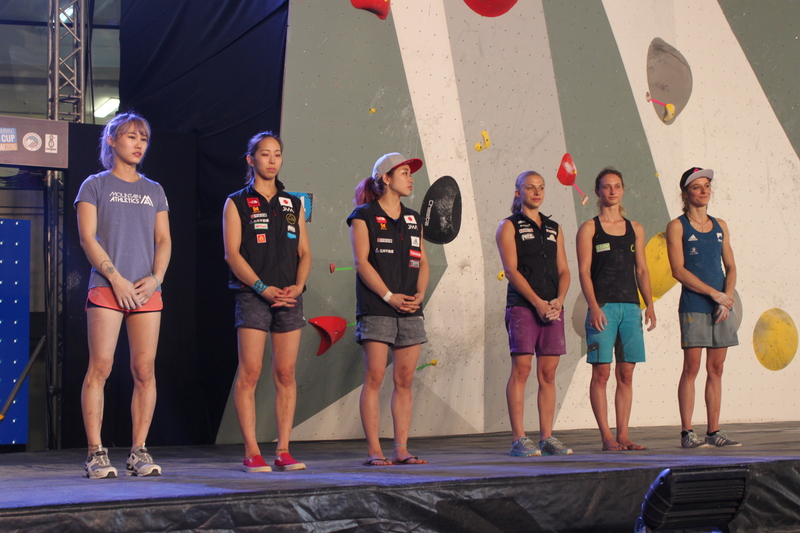 What advice would you give them, both in terms of how to handle themselves at top level competitions like the World Cup and in terms of making climbing their profession? Get inspired by the other climbers, yet go your own way. Don’t be pushy but take your time. In competition climbing a lot depends on experience, hence time is of the essence. What climbs occupy you nowadays? When do we see you in India next? I am currently teaching in high school, I even showed my students some pictures of Hampi and Badami. 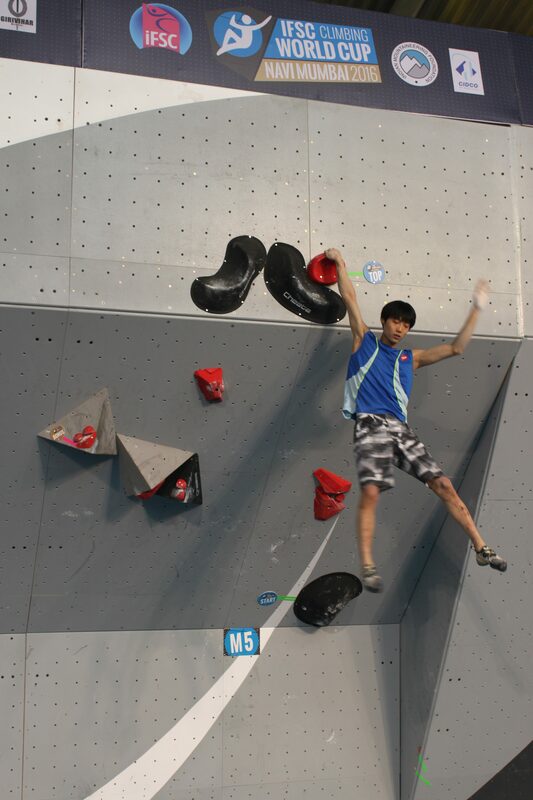 I will climb professionally again after July, when school ends. I hope to make it back to Badami in December.